Messages from Greg Nogradi and David Ezra-Okonsar reflecting on the recent terrorist attacks. 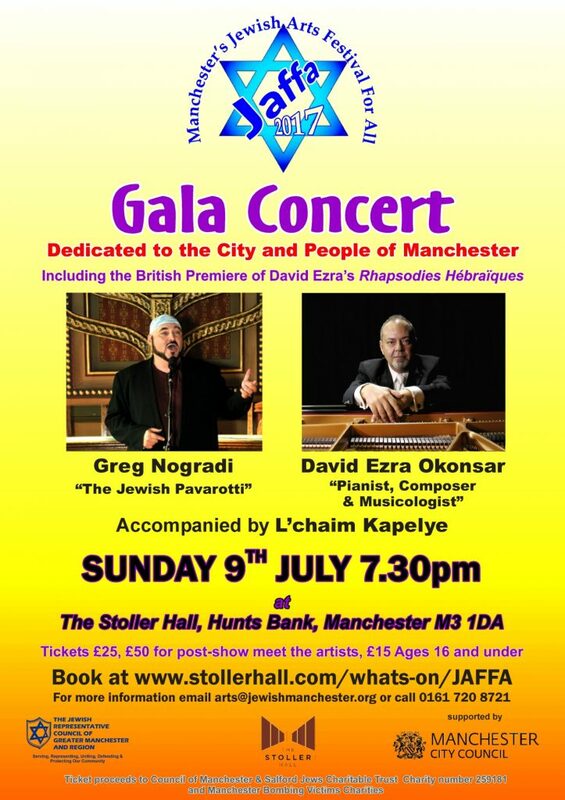 Both will be performing in a Gala Concert on Sunday 9th July at The Stoller Hall as part of JAFFA – the Jewish Arts Festival For All – dedicated to the City and people of Manchester. As part of the first Jewish Arts Festival For All (JAFFA) in Manchester, The Stoller Hall will host this Gala Concert featuring Greg Nogradi, David Ezra Okonşar and the L’chaim Kapelye Klezmer Ensemble. The winner of the 2016 Jewish Pavarotti Award, Greg Nogradi boasts one of the most significant voices ever introduced in Jewish Music. Recognised for his compelling dramatic tenor voice and passionate performance style during his university years both in Jerusalem and in Budapest, all roads led to the vocal class of Liszt Ferenc Academy of Music in Budapest and Music Academy Stuttgart for the young graduate in cultural management. After winning three major international competitions, Greg Nogradi found himself in the Verona Arena from one day to another, and subsequently sang five new leading roles annually at various opera theatres of the world until the turn of the millennium. After serving six years as the cantor of the Frankel Synagogue in Budapest, Cantor Nogradi was elected Europe’s Number one cantorial voice at the European Cantors Convention. David Ezra Okonşar will premiere his new composition Rhapsodies Hebraiques in two parts at the concert. A fervent researcher and aficionado of Jewish music and Klezmer, as a composer he adopts an expanded tonal language and models his renditions of the traditional Jewish melodies on the Hungarian Rhapsodies by Franz Liszt. Melancholy,sorrow,heartache coexist with bright cheerfulness and happiness in both major and minor modes. Okonşar is a classical concert pianist, modern-composer, orchestra conductor, musicologist and music writer. He has performed with orchestras and given recitals around the world, been a guest judge at the National Piano Competition of Japan and is a published writer in several music related periodicals in Turkey. He took Belgian citizenship in 1992 but at the same time the president of Turkey Suleyman Demirel awarded him the title “State Artist of the Turkish Republic”. Therefore, Okonşar settled in Turkey, his country of birth. L’chaim Kapelye is a 7-piece ensemble based in Manchester, who specialise in infectious dance tunes and soulful songs of the klezmer and yiddish folksong tradition. They play at many local events in partnership with organisations such as the Muslim-Jewish Forum and regularly meet at the Manchester Jewish Museum for the “Gathering of the Klezmorim” events, performing alongside other keen Klezmer-lovers in the area. They participate in fundraising ventures for the University of Manchester RAG (Raise And Give) society and work closely with The Fed, participating in reminiscence sessions in Jewish care homes around Manchester.